Sometimes all you need is a quick getaway for a few days – and it’s even better when you do it with your best friend! I was flying from Fort Lauderdale and my friend, Alessandra, from San Francisco. We figured Austin was the perfect middle spot. The trip began with a moment of crisis. When I went to grab my carry-on luggage from the overhead compartment I realized my bag was gone! Naturally, I panicked. I asked the attendant at the gate to please help me locate the bag. She made an announcement for those exiting the plane to please check their bags in the hopes mine would appear. In my frantic stage, I tried to run back inside the plane. Bad news: you’re not allowed back on the plane after getting off. After a few minutes, I see one of the flight attendants exit the plane with a brown roller bag. It wasn’t mine. I then ran downstairs to see if I could spot the person who had accidentally taken my bag. No luck, I checked in with the lost luggage office…no luck. The poor gentleman saw that I was a bit stressed out and helped me by calling the people that were sitting near my seat on the plane to check If they had taken it. After about one hour…I get a call from the girl who had taken it! She had grabbed it and didn’t realize it wasn’t her bag. The lesson learned here is: ALWAYS have a luggage tag on your bag, even if it’s a carry-on! There are so many fun things to do in Austin. We went in May but it doesn’t mean you can’t do any of these things year-round. We stumbled upon Zilker Brewing Co after walking around Austin during a very hot Saturday afternoon. The bartenders were nice and helpful. Their selection isn't very large but still great. I ordered the pale ale and the session IPA in the small sampler glasses, super cute and the perfect size. It was a very hot day in Austin so it turned out to be the best activity. Neither of us had ever paddle boarded so I was a bit nervous. They ask you to wear a lifejacket. It was $20 for the first hour or $40 for an unlimited time frame. They show you how to get on the board and they adjust your paddle based on your height. Not very many rules, they pretty much just let you go on your own. The water was the perfect temperature and the current wasn't very strong so it was pretty easy to actually stand on the board. I really really enjoyed it. Coming back, we were going against the wind so that made it a little bit more difficult but still very fun. Such a great activity and an awesome workout. A definite must in Austin! If you’ve seen any photo of Austin, you must have seen the “Greetings from Austin” Wall. It’s a very nice photo to take and keep as a memory. This is such a beautiful place, If you are a swimmer, you are for a treat! Water clear, clean and perfect temperature all year 65-68F. The pool is long--over 100 yards and over 25 yards across. The sides have ladders and stairs to get it, but the bottom is totally just the river bed. You can see rocks and vegetation as you swim along. They also have a diving board section and had lifeguards on duty. You can also walk around; the trails are clean and perfect to enjoy a nice jog or walk! Such a unique spot in Austin. This is an ever-changing work of art. This is a place of raw urban art, with artists painting over other artists' works, not even expecting themselves to stay long on the "headlines". Just a word of advice: climb and walk with caution! The rocky path could be a little slippery. This is such a great place! I was so excited to have authentic breakfast tacos and Tacodeli did not disappoint. SO delicious. The service was very good. I really loved it. The food is incredibly fresh, they use organic eggs, they support local vendors, and the food is affordable and SO tasty. If you're in the search of a great breakfast taco, you should go there. We visited Austin for Labor Day weekend, and we chose South Congress Cafe as our first brunch in the city. WOW. The wait was only a few minutes and we were offered a drink while we waited. The service was also very good, our waiter was very attentive. We ordered the amazing carrot cake French toast and the crab cakes with eggs Benedict. The mimosas were delicious…and they claim to have the best Bloody Mary’s in America. Despite our half hour wait, the service was very good. We started with an order of their award-winning, Kerbey Queso: guacamole covered with scratch-made queso and topped with pico de gallo. Then, we ordered the special pancakes of the day, "The Elvis," that had a special peanut butter glaze on top. We also ordered the eggs Francisco, which is English muffin layered with scrambled eggs*, bacon*, tomato, avocado and queso. I really didn't want the meal to end, it was so filling, affordable, and so delicious. An absolute Austin must! I am so happy we got to try Torchys! I ordered the fried avocado and the Democrat and they were both equally delicious. The Democrat was shredded beef, barbacoa topped with fresh avocado, queso fresco, cilantro, onions, and lime. It's served with tomatillo salsa. They had a very wide variety of options so it was a bit hard to just choose two. If you’re a burger lover…go here. We really wanted to try out the burgers at Hopdoddy. We had to wait in line for a little over an hour but were offered and served beer while we waited. We also got lucky with a free order of fries (yay). I ordered the Primetime burger and it was actually very delicious and super tasty. It had Texas Akaushi Beef, Brie Cheese, Truffle Aioli, Arugula, Caramelized Onions, and Steak Sauce. Even the bun was amazing. 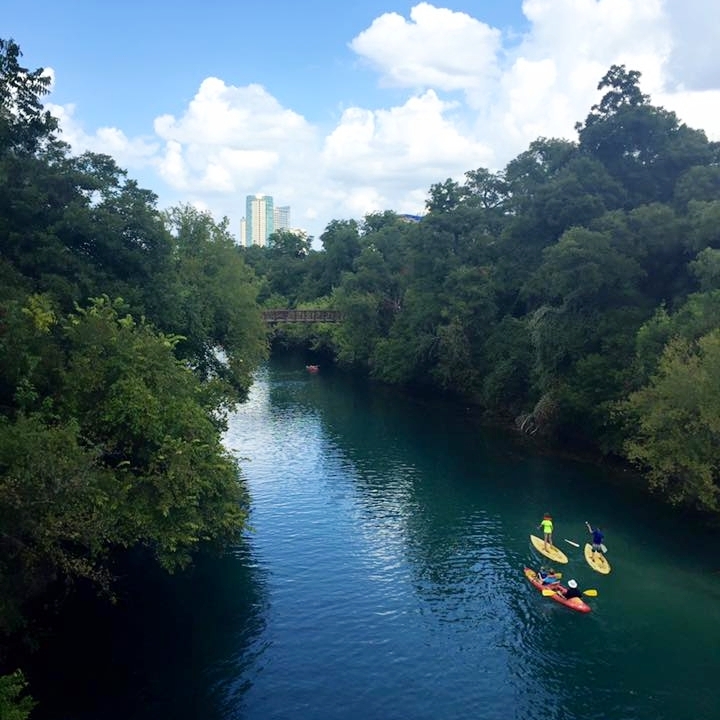 it's fair to say that Austin is a great destination for a getaway long weekend. There are so many great places to visit, different kinds of activities, and so many different delicious types of food to try! Do you have a favorite spot?